For the first time in its history, the number of ECCT members has surpassed 900 individuals. 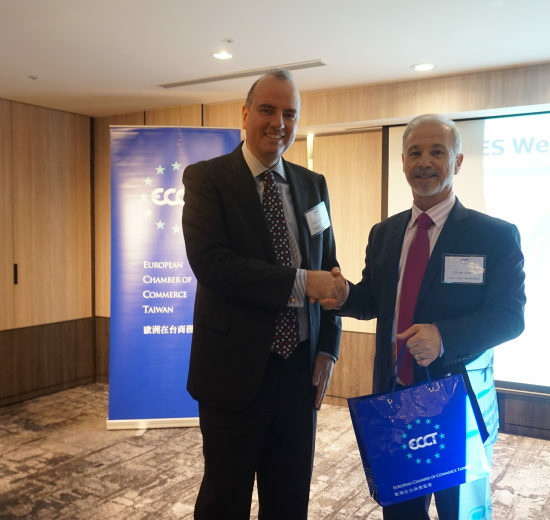 The announcement of the new milestone was made by ECCT Chairman Håkan Cervell at the ECCT’s 30th Anniversary Gala Ball held at the Grand Hyatt Hotel on Saturday night. 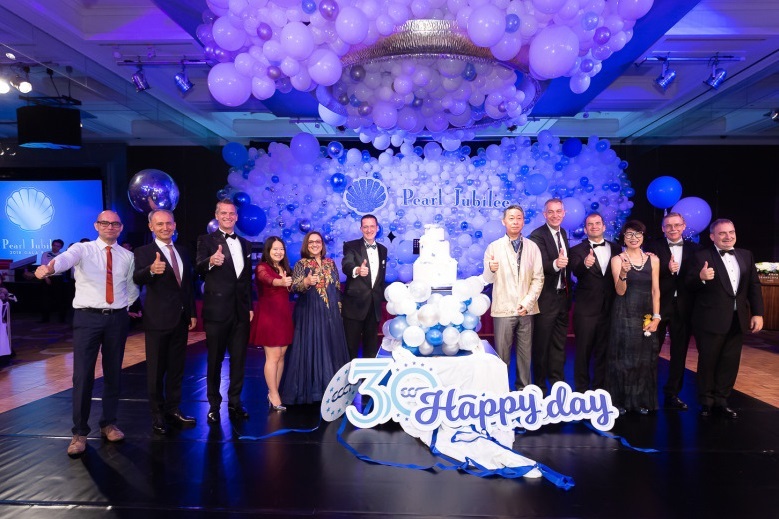 The announcement gave guests another reason to celebrate the ECCT’s 30th Anniversary Pearl Jubilee, which they did in style. Guests dressed for the occasion, adorned with pearl necklaces, earrings, broaches and rings. The evening kicked off with an elegant dance performance by Chen Xing-he that combined elements of the Taiwanese circus and traditional music. Later on, acrobatic performer Yang Shi-hau wowed the audience with a dramatic performance using a cyr wheel. The main feature of the evening was the dramatic unveiling of the ECCT’s 30th anniversary cake. As a prelude to the unveiling, a video was shown of the entire ECCT secretariat donning aprons, sifting flour, mixing dough and going through all the other motions necessary to make a cake. Then a large ball was rolled on stage and ECCT directors were invited to come on stage. Each of the directors grabbed a piece of rope and, on the count of three, pulled together to open the ball and reveal the cake. Judging by the skills demonstrated in the video compared to the final result, it was apparent that the staff must have had at least a little help from the Hyatt’s pastry chefs in preparing such a spectacular cake. The ECCT spared no effort to keep members entertained throughout the evening. To add a bit of fun, a blow up swimming pool was filled with plastic play balls. Some of the balls contained lucky tickets for prizes. But, for those who didn’t manage to find hidden treasure, it was just as much fun to float among the balls. This year, for the first time at a gala ball, a manicurist was on hand where guests could have their nails painted and adorned with pearls. For those who enjoy gaming, two gaming tables were set up for guests to try their luck. The currency was chocolate euros. Those who spent their chocolate euros early could get more with the purchase of raffle tickets. No European gala ball is worth its salt without fine cuisine and wine. Guests were treated to an array of superb dishes prepared by the Hyatt’s star chefs. And for guests wanting to just relax and enjoy a few drinks, there was a great selection of beverages, including beers and spirits at the bar. This year there was also a Nespresso bar where guests could savour special coffee-infused cocktails or any other kind of coffee. This year’s raffle featured some spectacular prizes including flight tickets and overseas hotel stays, thanks to the generosity of the sponsors. And of course no ball is complete without music and dancing. A five piece band, featuring the singers Leveay and Dooley, played some lively tunes, giving guests a good reason to take to the dance floor and show off their skills. In the company of good friends, accompanied by music and beverages, the party went on well past midnight.